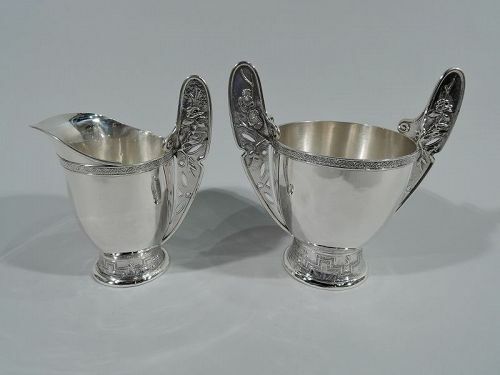 Japonesque sterling silver creamer and sugar. Made by Tiffany & Co. in New York. 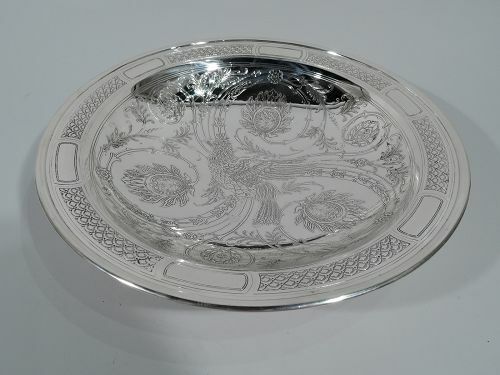 Each: Curved and tapering bowl on raised and spread foot decorated with fretwork, cranes, and blossoming branches. Flat and tall fan-form handles with volute scrolls mounted perpendicularly to rim. Handles decorated with blossoming branches. Rarefied exoticism. 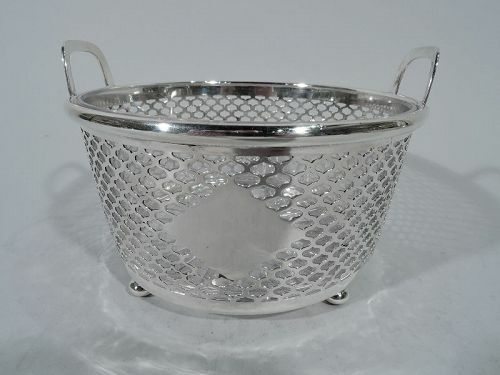 Hallmark includes pre-1875 pattern no. 3205 and director’s letter M (1873-91). Very good condition. 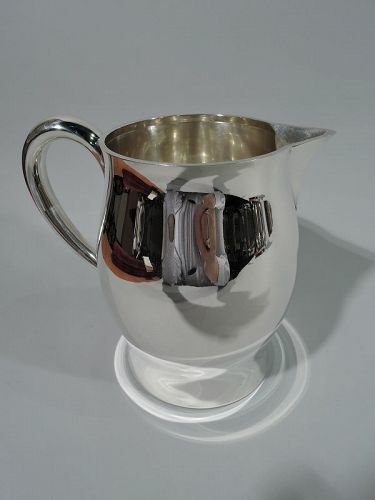 Midcentury Modern sterling silver water pitcher. Retailed by Tiffany & Co. in New York. 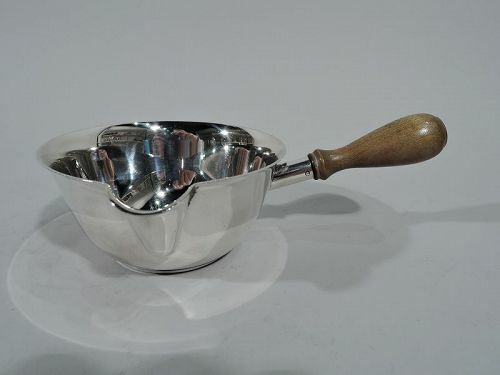 Voluptuous curved body with v-spout and high-looping handle. Hallmark includes volume (3 1/2 pts). Very good condition. 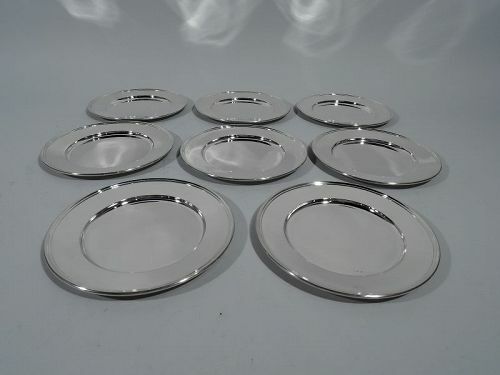 Set of 8 Modern sterling silver bread and butter plates. Made by Tiffany & Co. in New York. 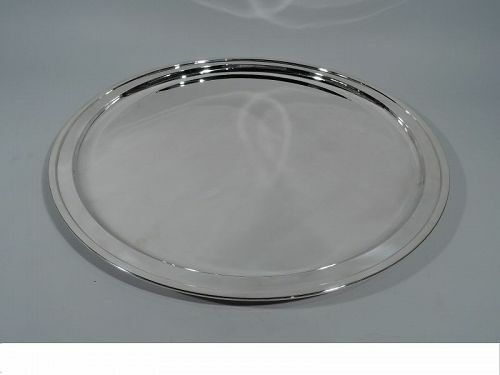 Each: circular well and molded rim. Spare and functional. Hallmark includes pattern no. 20064 (first produced in 1922), order no. 6101, and director’s letter m (1907-47). Very good condition. 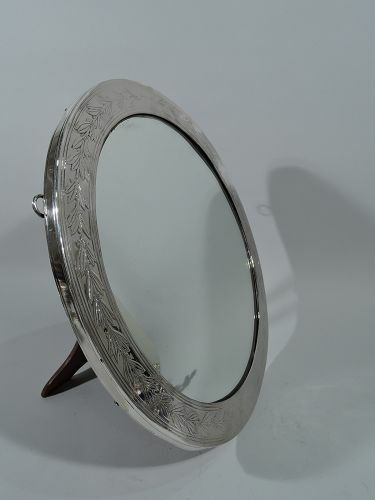 Antique Empire-Revival sterling silver table mirror. Made by Tiffany & Co. in New York. Circular looking glass and flat surround acid-etched with laurel wreath between reeded borders. Sides have incised bands. With stained-wood back and hinged support and 2 loose-mounted rings. Hallmark includes pattern no. 17395A (first produced in 1909) and director’s letter m (1907-47). Very good condition. 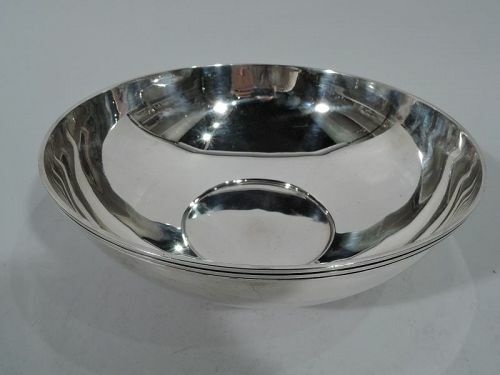 Aesthetic sterling silver bowl. 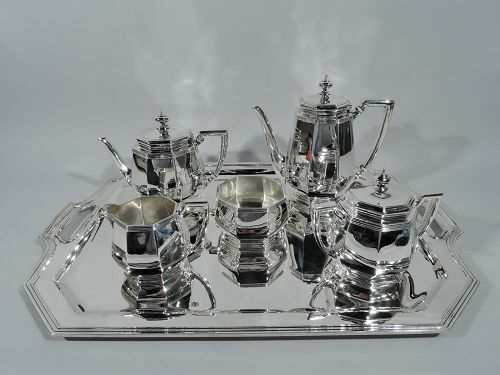 Made by Tiffany & Co. in New York, ca 1914. Round with molded rim and foot ring. Acid-etched interior: A bird with patterned plumage and loose foliate scrolls with flame flowers. Rim has cartouches (vacant) alternating with fish scale ornament. Possibly inspired by Hispano-Moresque maiolica charger. Hallmark includes pattern no. 18696A (first produced in 1914) and director’s letter m (1907-47). Very good condition. 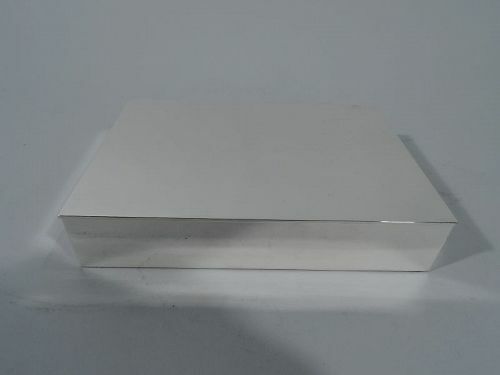 Midcentury Modern sterling silver box. Made by Tiffany & Co. in New York. Rectangular with straight sides and flat and hinged cover. Box interior cedar-lined and partitioned. Hallmark includes postwar pattern no. 25313. Very good condition with crisp corners. 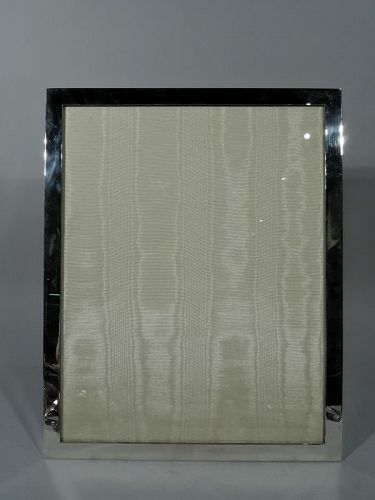 Very large Modern sterling silver picture frame. Made by Tiffany & Co. in New York. Rectangular window with flat surround. With glass, silk lining, stained-wood back, and hinged silver support for portrait (vertical) display. Hallmark includes no. 463278 and director’s letter m (1907-47). Excellent condition.